With New York markets closed Thursday for the Thanksgiving holiday, shares of RIM are flying in Canadian trading. 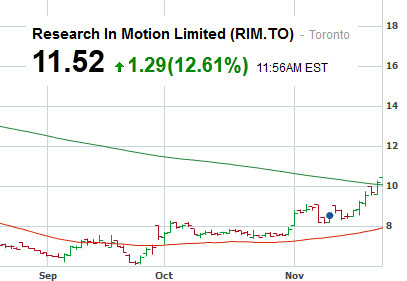 On the Toronto Stock Exchange, Research in Motion stock is 12% higher as traders and investors are getting excited about BlackBerry 10. One analyst raised his rating on the stock due to "positive sentiment building in the industry". The stock is the most actively traded issue on the Toronto Stock Exchange on Thursday. RIM CEO Thorsten Heins has been on the road, promoting BlackBerry 10 which is the new OS developed by RIM. The software will be launched on January 30th along with the first two handsets to run on the platform. On Thursday, National Bank Financial analyst Kris Thompson raised his price target on RIM's stock to C$15 from his previous target of C$12. The shares currently are valued at C$11.52 after a rise of C$1.29. Four years ago, RIM was trading above C$140. Thompson sees RIM shipping 35.5 million handsets in 2014, up from an earlier estimate of 31.6 million. The analyst says that some of that increase is due to speculation that RIM will release the new handsets globally in February, instead of March as earlier thought. Thompson feels that the rest of the increase is due to the "positive sentiment" in the industry relating to the new OS and phones. If only Blackberry, android and apple fantics stop hating and cursing each other, the world would be a better place to live. RIM is really successfully at creating a big interest (hype) toward BB10. I really fell pity to those 'investor' that buy the RIM share without really seeing the product.....!!!! BB10 is a solid product compared to BB6/BB7, unfortunately it won't make the android/iOS crowd change into BB10. and for most (97%) of current BB user would be better buying android/iOS. The era of BB already over, and BB10 only prolong the death of RIM by another year. 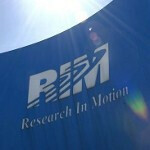 RIM will down from 3% to 0.3% in year, and become irrelevant. I am actually contemplating investing a little bit of my own money in them, i can just see BB10 doing very well, better than that poor excuse of a phone OS MS has made. I may also get myself a BB10 phone as a 2nd phone. Even if people don't like BlackBerry, this is good news and I hope they do well. More companies and phones = increased innovation. "Even if people don't like BlackBerry," correction...only on US they dont like BlackBerry that much! while asia africa and some parts of europe, they love BlackBerry! "More companies and phones = increased innovation." but this!! so agree to this! the one who love blackberry is 1d10t in Indonesia, where it used to be a BB stronghold is now 70% android. BB is already dead!!! lol...you're nikolas.oliver!!!! i dont care about that numbers... why dont you just accept the fact that RIM and BlackBerry will still be their!! and besides...more companies, more innovations!!! if you love your android that much, so let it be! but RIM and BlackBerry is always welcome to the world coz they are making huge effort and will bring new innovation and modification! Good luck BB!! Let's see what you bring to the table!! I wish rim the best of luck, and hope BB 10 makes people start to recognize blackberry again. But honestly I feel they waited too long for this. it's going to be very difficult to compete with Android and IOS and maybe even wp8. The only way I see them competing is if they bring something groundbreaking to the table. lol nikolas you're so pathetic... hiding in different USERNAME!! PhoneArena Should Ban you for GOOD!!!! iOS 7, android 5 and windows phone 8.5 will kill BB 10. But isn't it obvious? Don't you think that RIM has made a huge mistake by holding back BB10 for so long? Google is owning everyone's a$$ when it comes to innovation. Apple is kind of behind but will catch up next year with iOS 7. Windows phone just needs few more improvements. BB 10 may extend RIMs life but for how long? Do you think it has any killer features? if WP is really working and popular, nokia should be on sky high right now! and 3 quarters is enough to prove that the WP plan is working! they should be back on top 10 manufacturer! but no! it just got worst! they are now top 11! while RIM on top 3! you cant say that BB10 will be dead on arrival coz BB10 has more potential than what can WP8 could actually offer! yeah the live tiles and resizable tiles is good! but still not enough to impress most people! RIM needs more time and 2013 is a good new start for them! i agree that iOS7 and android 5 will kill BB10 but WP 8.5??? WP7,7.5,8 is also a big joke. 2014? I hope that's a type-o. I agree with nobelset..too bad there is so much nastiness between the tech companies. I am rooting for RIM myself, having had many Blackberries in the past and enjoying them very much. I have found pros and cons with almost all of the OS's I've had, but also with each one, have found many more pros than cons. Good luck RIM!! Looking forward to 1/30. Massive failure coming, however I wish the exact opposite - great success to BlackBerry!